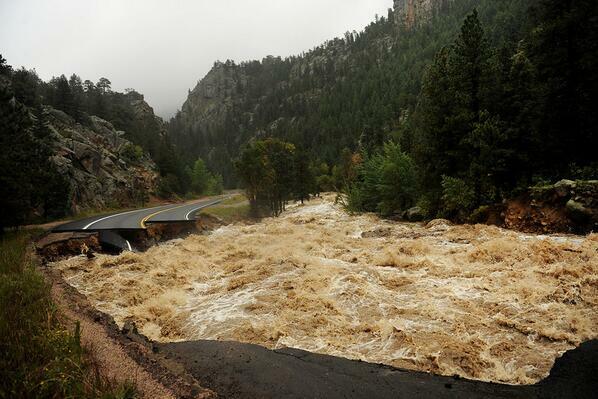 Mother Nature is having her way with Colorado. Last year it was baptism by Fire. This year its baptism by Water. Colorado is renewing herself. There are forces beyond our control. Mother Nature is only one of them. There is an art to surrender and every now and then we’re forced to develop those skills more than others. Mother Nature is a cyclic lady. She cycles with the moon, waxing and reaching her fertility peak and then waning; women closely mirror her cycle with their own monthly cycle (read how to get the most out of that cycle in Have a Happy Period). She cycles with the seasons as well. Each season has gifts to offer us if we roll with it. If we fight it, of course, that’s like rushing headlong into a flash food insisting that our next meeting is so important that Mother Nature be damned. Such resistance will deplete us and might even kill us. Law of Attraction too responds to the cyclic nature of the Universe. As the air becomes crisp with fall, or the rains come and they come and they come and they wash the debris of summer away, your energy naturally begins to wane. All of that summer enthusiasm has peaked and now fades. You begin to look for more calming ways to spend your time. You spend less time going, going, going and more time seeking quiet and stillness. Fall is also the time of harvest. Many people find themselves restless during the transition between summer and fall. The seeds planted in the spring, taking the summer to bloom, now bear fruit. Do you like what you planted? Are things coming to you seemingly effortlessly? Is the project you’ve been working on suddenly bearing fruit? Are people coming out of the woodwork to assist you? Are you feeling like lingering projects need completion? Are you introspective and reflecting on whether you’re happy with your results so far? You reap what you sow—did you sow that which serves your highest good? The nights are long and the days are short. If you’re not introspective and meditative during this time then you’re doing it wrong. You want to spend more time indoors, sitting still, being inside yourself. This is a time of evaluation, planning and calling forth. The first part of winter, leading to the darkest night, is a time to reflect on your last full cycle of seasons. The second part of winter, leading to spring, is a time to create intentions for the next cycle of seasons. Relax into it. Winter is the perfect time to heed the advice: Be still and know that I am God. If you take the time for stillness you will have the ethers open up to you and you’ll be infused with inspiration and new ideas for not only what you want to attract and create, but also how to do it. As the days get longer and baby grass pokes it’s head up, your energy starts to pick up. You’re easily inspired and ready to start projects. Anxious to get things done, you’ll spend less time indoors and less time in introspection. You’re energy will be outward, you’ll become more social. You’ll be attracted to new people and new opportunities. This is the time when you’ll be sowing seeds for the rest of the year. During winter you’ve decided what you want to sow, Spring is the time that you sow it. You’ll make the calls, send the emails, take the lunches. You’ll sign up for the dating websites or create a romantic environment for you and your lover. You’ve planned and now you’re ready to sow what you want to reap in the fall. This is a great time to make enormous strides on those New Year’s Resolutions and to take the risks required to leap into your big dreams. With the Intentions set, the ground tilled and the seeds sown, Summer is a time for flowering and flourishing. There’s some weeding to be done during this time, to make sure what you’ve sown is going to harvest properly, but you have some time to ride roller coasters, splash in water parks, linger by the pool with fanciful novels and see something new. Your energy runs high and optimism is easy. Not very introspective, your energy is quite external during summer. All things seem possible and delightful during summer. The “summer vacation” vibe lingers from childhood and you’re just not putting yourself under a lot of pressure. The days are loooooonnnngggg and you naturally need less sleep. Using the cyclic nature of the seasons will get you the best results when you’re trying to change your life using Law of Attraction. Fighting Mother Nature is fighting your own natural cycles and it won’t net you the results you’re after. Law of Attraction works best when you’re in flow. 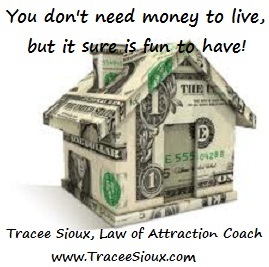 Tracee Sioux is a Law of Attraction Coach at www.traceesioux.com. She is the author of Love Distortion: Belle, Battered Codependent and Other Love Stories. Contact her at traceesioux@gmail.com. Change My Life: Oprah Please Don't Leave Me!